Those dark brown, spikey nubs in your spice drawer have many more uses than spiced cider or mulled wine. Containing strong anti-bacterial, antimicrobial and antiseptic properties, cloves can offer relief for toothaches, boost your immune system and aid in digestion, to name just a few. I use Clove Infusion to ease oral discomfort before and after dental work to promote a bacteria free environment in the mouth, warding off infection. Place 1 Tbsp. 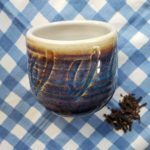 whole cloves into tea infuser, small tea pot or ceramic mug. Add boiling (filtered) water, cover and let steep for 12 minutes. Let cool slightly before sipping: gently swish warm infusion throughout mouth, paying particular attention to the affected area so that the liquid coats it entirely from all angles. Swallowing liquid will give your digestion a boost too, so go for it! Drink 1 cup of infusion 2-3 times per day or until pain and/or risk of infection have passed. 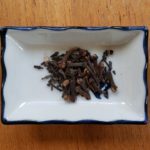 Clove Infusion is a super easy and economical go-to for pain relief in the mouth. Its infection-fighting properties rival any antibiotic.